These movements are based on traditional dances G. I. Gurdjieff studied during his trips in Central Asia, in India, in Tibet, in the East and in Africa, where he visited with several Sufi and Indo-European orders, as well as Buddhist centers and other sources of traditional culture and teaching. During his career as an instructor, G. I. Gurdjieff also composed numerous movements and exercises himself, that he taught to his disciples in the framework of a work of self-observation and self-study. The exact number of these movements is unknown, there are several hundreds of them, maybe thousands. 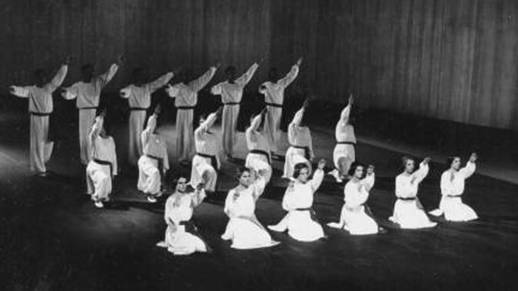 Numerous exercises created by Mme de Salzmann and by other Gurdjieff disciples were added to these movements. Overall, at least 250 movements have been preserved, mainly through the work of Mme de Salzmann and of Mrs Dushka Howarth.